Nearly a million NHS staff are due to receive a long-awaited pay rise at the end of this month. But new figures released quietly last week have caused fury—and confusion even amongst some unions. "I’m as dismayed and angry as you are and will fight the corner of members at every turn. In good faith, we told all members that they would receive a 3 per cent uplift this summer. I now find that this is not the case for everyone. "I can assure you that I am demanding answers for you. In the meantime, I can only apologise for this unnecessary confusion and assure you that I am determined to resolve it. Your elected Council and Trade Union Committee will be meeting in the next few days and I will update you on next steps." But many NHS workers could be in for a nasty shock. NHS Employers, the official body in charge of NHS staff, has just published the new 2018/9 pay rates – and to many NHS workers they do not appear to be the same as the 2018/9 pay figures staff were pointed to before they voted on the deal. In fact, averaged across all pay bands and scale points, they appear to award initially only around half the pay rise from April 2018 that many staff may have been expecting, according to OurNHS’s calculations. Similarly Unite emailed members in March, linking to the calculator - www.nhspay.org/. A bigger problem arises because the cost-of-living increase and the increment will be received on very different dates. While many staff thought that the whole new salary would be back-dated to the start of the financial year in April, in fact, only the relatively small cost of living increase will be. Their annual increment - usually the bigger part of the increase - will only come in on the anniversary of when they started with the NHS: which could be many months later. The result is that many staff will be earning hundreds - or even thousands - of pounds less this year than they had understood when they voted for the package. The issue potentially affects nearly half of NHS staff, though those on the top of their pay bands are not affected as they were not due an increment anyway, and those on the very lowest levels of pay (the 90,000 staff currently earning under £17,460) are not affected as they will get the full pay rise with effect from 1 April, unlike other staff. GMB’s National Officer Rachel Harrison commented, “All that glitters is not gold and it's now clear that Jeremy Hunt's last act was to try and mislead NHS workers who have already endured years of real-terms pay cuts. We have always warned that the devil would be in the detail, and so it has proved...That is why GMB is holding an indicative ballot for industrial action over this pay offer." Furthermore, the GMB told OurNHS that under the pay deal, the ‘increment’ is no longer automatic or definite – in future, it will depend on assessment, though there will be a transitional period (though we've been told contradictory infomation about this). The confusion is likely to stoke fury, with many staff affected across the board. A senior nurse or Occupational Therapist on pay band 6, point 28, was promised an increase of £3,995 in year one – but instead, according to NHS Employers, from April 2018 they’ll get only £508 more until their incremental increase kicks in. At more junior levels an experienced Healthcare Assistant in the middle of Band 3 will have been expecting their pay to rise by £1039, but instead from April 2018 until their increment kicks in will get an increase of only £291 a year. Such examples are typical - according to OurNHS’s calculations, on the basis of the pay calculator information, NHS employees (averaged across all grades and pay points) were expecting a pay rise from April 2018 of £2,184.18 a year. To begin with at least, they’ll get less than half that – an average across all grades from April 2018 of £973.16. (Note – all these figures are higher than the actual average across all staff, because they are skewed by the relatively small number of staff on higher grades). The deal also incudes a "no detriment" clause, which means that no one should be worse off. 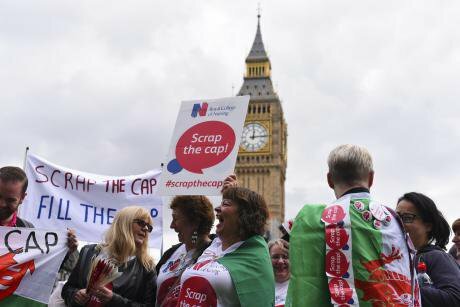 But mmembers of NHS staff Facebook groups were last night saying they felt “shafted”, “screwed over” and that “the government has lied” – with some also criticising unions. All of this gives weight to union activists warnings that NHS staff would have been better rejecting the pay deal and taking further industrial action. 19 July: This article has been amended to clarify that no staff should be worse off as a result of this deal, and that we've been told contradictory information about the exact timing of changes to the increment process.